The Vancouver Condo Buzz » TOP PROJECT! 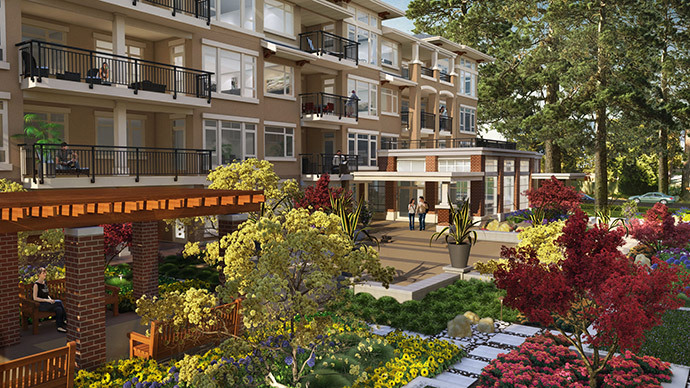 South Surrey ADAGIO Condos by Boffo (Trusted and Boutique Builder!) with 1 to 3 Bedroom Floor Plans > Great Location & Amenities at Adagio Surrey Apartments for Sale! « Luxury Vancouver Homes for Sale at West 11th on Burrard in Kitsilano > Townhouse Style Homes that are Brand New and Very Unique! Brought to you by Boffo, the new South Surrey Adagio Homes for sale will feature 50 executive style apartments in one of the most amazing locales in the Lower Mainland. Coming soon to the heart of Semiahmoo, the Adagio Surrey homes will feature 1, 2 and 3 bedroom floor plans, an inspirational/traditional West Coast feel and BC’s top Boutique Home Builder. 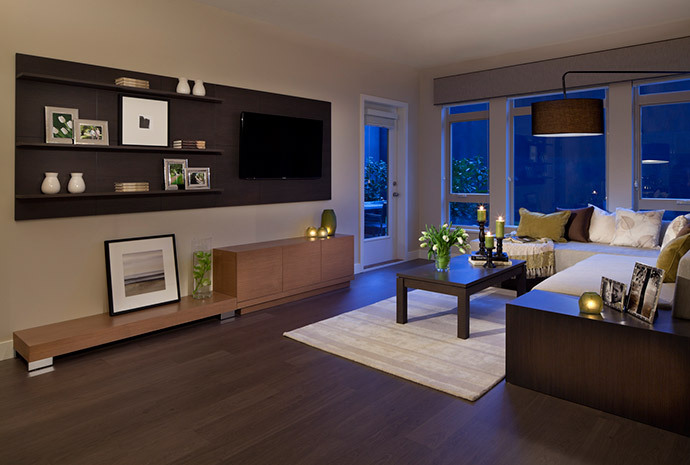 With upscale finishes and thoughtful details throughout, the new South Surrey Adagio Homes will be launching sales in Spring 2013. The Adagio condo building architecture is contemporary yet classic and is designed by world renowned architectural firm, Chris Dikeakos Architects Inc. Throughout the community, there will be professionally landscaped grounds, beautiful outdoor living spaces and a central courtyard. The Adagio Surrey condo community will also feature a professionally designed and fully furnished resident’s only lounge/clubhouse complete with a chef’s demo kitchen, double sided fireplace, TVs, pool table and an expansive terraced garden and outdoor patio area that is suitable for small and large gatherings/parties. As well, the South Surrey Adagio condos will also feature a state of the art, fully equipped fitness gym with showers and change rooms, hotel style spa and a steam room. As with all Boffo condo developments, security is of utmost importance. Here at the South Surrey Adagio by Boffo condos, you will find solid front doors with mortise locking hardware, in suite security system, personally encoded entry device that permits you into the condo building lobby entrance, elevators and individual floors. In addition, the Boffo Adagio Surrey condos will have a secured underground parking area and a car/pet wash station in the parkade. There are security cameras in common areas as well as a video enterphone system. All homes at Adagio Surrey condos have in suite hard wired smoke detectors as well as fire sprinklers. The building envelope utilizes the latest in rainscreen building technology and design and every home comes with the Travelers Guarantee Company of Canada warranty. The interiors are designed by award winning Cristina Oberti Interior Design Inc and home buyers have 2 colour schemes to choose from. The homes at Boffo’s Adagio South Surrey condos will have sleek and sophisticated cabinet choices with soft closers and stainless steel hardware (in both the bathrooms and kitchen!). As well, there are carpeted spacious bedrooms and laminate floors in the living spaces. Most homes have generous outdoor living spaces and the penthouse level has vaulted ceilings up to 15 feet high! Standard finishes also include multi media outlets in every room, central data media box, individual 40 US gallon hot water tanks and custom built closet shelves. Other thoughtful details at the presale Surrey Adagio condos includes elegant faux wood blinds, double glazed Argon filled windows and energy efficient basement heating. The spa inspired bathrooms at Surrey Adagio by Boffo condos include custom suspended ensuite vanities with radiant heated flooring. The counters are of quartz or natural granite with a matching back splash in addition to sleek Jewel faucets and under mounted sinks by Kohler (his and hers in select floor plans). 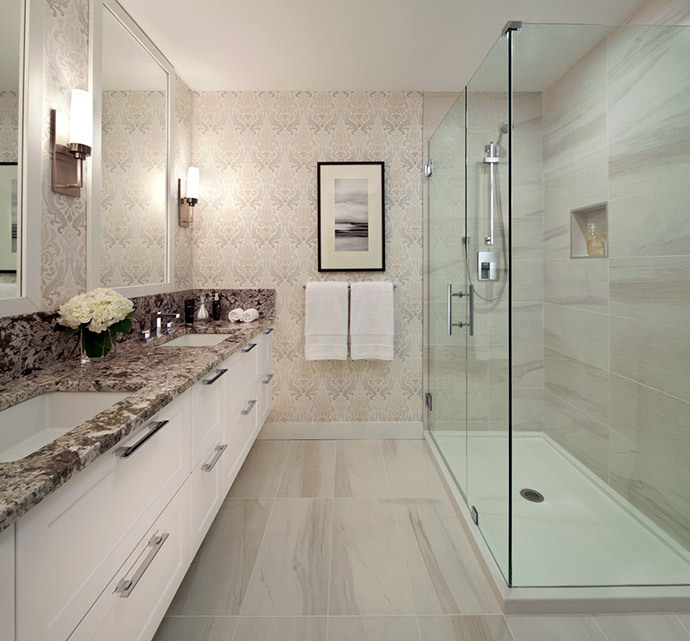 As well, the presale Surrey Adagio condos for sale will feature oversized showers with frameless glass enclosure or oversized soaker tub/shower combo with built in niches in the ensuite bathrooms. Large framed mirrors and professionally selected lighting are other features of the bathrooms. The chef inspired kitchens will include a Kitchen Aid Architect Series II stainless steel appliance set in addition to rich cabinetry and large format porcelain tiled floors. As well, the new Adagio Surrey condos for sale will feature award winning Blanco faucet and large under mounted Kohler sink in stainless steel with in sink waste disposal and installed soap dispenser. The gourmet kitchens at Adagio by Boffo will also feature 40” upper cabinetry and some units will have oversized pantries for additional storage. There is under cabinet lighting and recessed lighting for bright work spaces in addition to kitchen islands and a wine chiller. 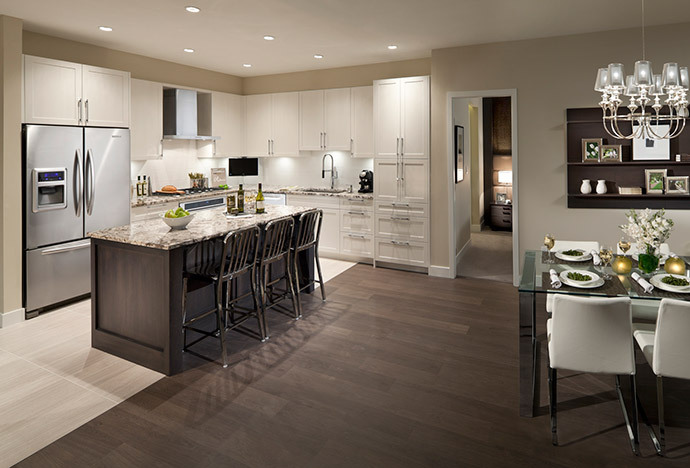 The Adagio Surrey condos will also feature natural granite or quartz slab counters with complimenting backsplashes. January 2013 Update! If you are a local and have driven by recently, you will have seen that things are moving along quickly on site. Construction of the first building at Adagio by Boffo in South Surrey real estate district is well underway, and framing has started on the second floor. Come by the site at 20th and 154th and you’ll see for yourself how the building taking shape. These 50 exclusive Adagio Surrey homes will be ready to move in later this year! The Adagio Surrey condo presentation centre and fully finished display suite is also under construction and will open for previews and pre-sales this Spring 2013. 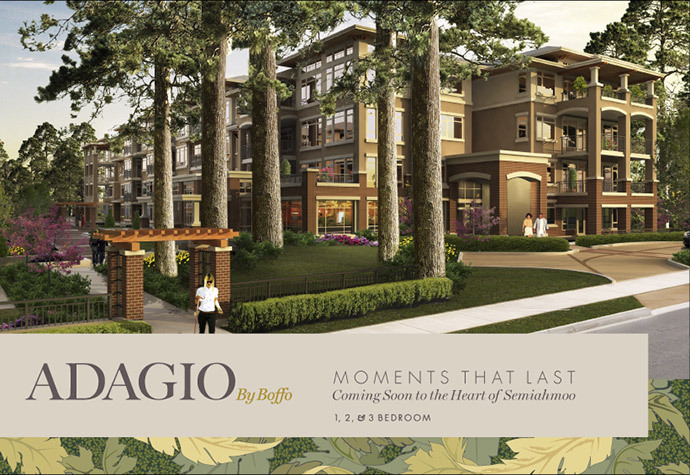 As a South Surrey Adagio Condo VIP registrant, you will be the first to view the presentation centre and experience Boffo’s signature quality throughout. You will also have the opportunity to purchase a home before the public Grand Opening, and have first choice for your home selection. In the tradition of all Boffo projects, Adagio in Surrey promises only the best craftsmanship, innovative design, and sophisticated finishings – inside and out. Visit www.AdagioByBoffo.ca for the latest news and special events.